The Comlink saw many forms over the course of the classic Star Wars films and Episode I continues the variety. 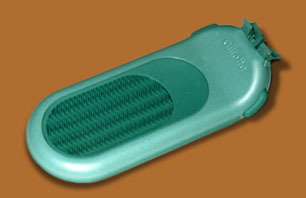 The versions in use by Qui-Gon and Obi-Wan are based on a Gillette Sensor Excel ladies razor. 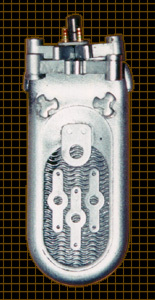 More precisely, a resin casting of the razor was used as a base for the addition of several pieces including 3 solder lugs like the one pictured below. Seastrom Manufacturing Company makes solder lugs similar to those used on the comlinks. Model #5403 is their closest one, but it is larger than the ones used on the actual prop. Seastrom only deals in large quantity orders (100 or more). These solder lugs are about 1" long, possibly a fraction less. The "D"-shaped piece with the two small holes above a larger one is likely a different configuration of solder lug. Another of these "D" pieces was used on the top of the comlink. The voice pickup goes through the large center hole and small gold antennae through the other two holes. The two antennae on the Jedi comlinks (movie and prototype versions) are actually matrix pins. 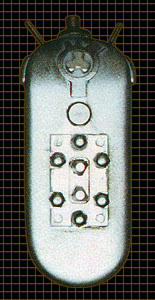 Matrix pins are the female side of Cannon plugs (a type of wire connector) used in the matrixes usually related to digital flight controls in modern aircraft. The pins shown in the photo below are from the F-16. 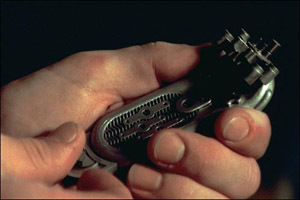 Note: On the Qui-Gon prototype comlink seen at top (backview), the gold ends of the matrix pins are inserted into the razor - upside down compared to the movie version. The piece used for the voice pickup is still unidentified, but we do know what it looks like. By identifying the same part used on the signalling unit, we have come up with this photo representation of what the unmodified part looks like. It's possibly a solenoid rod from an electrical device or a contact tip for a MIG welder. Changes to the basic razor include filing off the thin side ridges and filling in the grips on the back, presumably before casting the base comlink. Items on the back of the prop, as seen at the top of this page, include a special tab lock washer scavenged from something. In the center of the tab lock washer is a unidentified tri-wing piece like the other two seen on the front. Below this is a rectangular piece held on by two specialty screws and six small acorn nuts. It should be noted that the back view of the comlink at the top is not the final film version. The main differences include the removal of the two thin antennae on the top and the addition of the array of four similar pieces to the top front of the comlink. We are still researching the rest of this prop. Gillette Ladies Sensor Excell Razor Handle $5.00 Target, Walgreens, Etc.